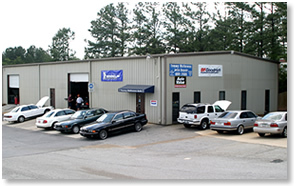 Tommy Mathewes Auto Repair has been serving the Augusta area since 2004. We have quickly grown to be one of the premiere BMW and Mercedes independent service facilities in the CSRA. Tommy has been ASE Master Certified since 1983 with more than 25 years of automotive experience and are dedicated to quality diagnosis, service, and repair of your vehicle. In addition to experience, Tommy Mathewes Auto Repair has a modern, well-equipped shop with the latest tools, diagnostic equipment, and technical information systems. In additon to BMW and Mercedes, we also service all domestic and imported vehicles including Jaguar, Land Rover, Mini's and Volkswagen. Call us at 706-868-7485 and let us know how we can help you.